The Invacare Adult Hemi Walker is designed for patients with limited or no dexterity in one arm or hand. 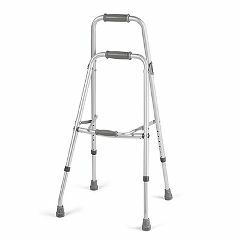 This lightweight walker combines support and stability, yet is easy to lift and maneuver, even with one hand. Height Adjustment: 29 - 36"
Safe. Stores Easily. Lightweight. Supports Weight. Easy To Use. Well Constructed. Have used these for four years. Very pleased. Well Constructed. Lightweight. Easy To Use. Stores Easily. Safe. Supports Weight. This walker is great. Easy, lightweight and no slips so far. Would recommend to anyone. I have been this site by error and it has been great. Everything I need so far it there! Lightweight. Supports Weight. Easy To Use. Well Constructed. Safe. Stores Easily. Short Distances. Indoors. Outdoors. Long Distances. Safe. Stores Easily. Lightweight. Easy To Use. Supports Weight. Things that aren't so great about the walker is the cups on the bottom tend to stick the floor. Well Constructed. Lightweight. Easy To Use. Supports Weight. Safe. Good stable walker for a stroke victim with hemiplegia. is this the lightest weight of hemi-walkers? the weight is 2 lbs and 14oz. My mother is very tiny, 4'8" and her hemi walker is heavy for her. Are there hemi-walkers for children that she could use? What is the highest inches there is for a Side Hemi walker, Need one for six foot patient..Brand name? any attachment to allow carrying a glass of water or cup of cofee? Asked on Feb 23, 2012 5:54:21 PM by jim from n.c.